Lee Martin is a favorite author of mine, and I was flattered when he became the fourth writer to contribute to this Book Notes series with a music playlist for his novel, The Bright Forever (a finalist for the Pulitzer Prize for Fiction). One of the highlights of this series is that essay's inclusion in the paperback version of the book. 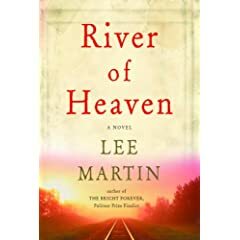 Martin's latest novel, River of Heaven, explores the weight of secrets with his characteristic eloquent prose. The first time Largehearted Boy invited me to write liner notes for one of my books it was for my novel, The Bright Forever. At the time, no one knew that the book would end up being a finalist for the Pulitzer Prize for Fiction or that I would spend some wonderful afternoons and evenings chatting with book clubs. Inevitably, during those chats, someone mentions the fact that so many songs are referenced in that novel. This happens in all my work, most recently in my new novel, River of Heaven, a story told from the first-person point of view of Sam Brady, a sixty-five-year-old man, living with a secret in the small town of Mt. Gilead, Illinois. “You have to know the rest of my story,” he says at the end of Chapter 1, “the part I can’t yet bring myself to say. A story of a boy I knew a long time ago and a brother I loved and then lost.” With that, he sets into motion this tale of the death of a boyhood friend and what it brought to Sam’s life, particularly his estrangement from his brother, Cal. River of Heaven is Sam’s confession, and along the way, a number of songs underscore his involvement in a past wrong and his present-day journey toward redemption. This is the song playing on the radio inside the Finn house on the night the sheriff comes to tell the family that Dewey is dead. Just after 6pm, the B & O National Limited passenger train took the curve north of town, and there at the trestle lay Dewey on the tracks. The death is ruled a suicide, but as Sam tells us his story it becomes clear that the whole truth about that evening has yet to come out. When I was working on River of Heaven, I listened to Carl Perkins religiously. Not only “Blue Suede Shoes,” but also songs like Boppin’ the Blues and Everybody’s Tryin’ to Be My Baby and Honey Don’t. Songs with backbone and attitude—jazzed up and sharp as a razor, as Sam’s brother, Cal describes the music, once he’s back in Sam’s life and telling him about his own and how he’s in trouble because he stumbled onto a militia group with a plot to bring down the Sears Tower. He needs a place to hide, and Sam’s willing because he hopes they’ll remember what it was like to be brothers. “Blood to blood,” he says, not knowing that Cal’s presence will lead him down a road of danger before he makes the turn toward redemption. The Carl Perkins songs helped me build Cal’s character, a man still out there on a tightwire. Perkins once described his music as “country with a black man’s rhythm.” It came out as rockabilly, and in River of Heaven, Cal is one of those men who was a rockabilly cat when he was a young man all jacked up and ready to go. A real tomcat who wore gabardine slacks with red flames stitched on the hip pockets, and two-tone shoes just right for dancing to Carl Perkins or Jerry Lee Lewis or Lefty Frizell at the juke joints. A few weeks ago, I started playing All Revved Up by Meat Loaf, and that song’s a kindred spirit to those Carl Perkins tunes, at least when it comes to the pent up heat they contain. Songs that capture the fever of small town boys all revved up and looking for the next best thing. That’s Cal, the man who walked out of his brother’s life because of what really happened that night when Dewey Finn died. Sam’s journey in River of Heaven starts when he builds that doghouse in the shape of a ship, and little by little he works the story of Dewey Finn up to the surface. This song by The Carter Family, though it doesn’t appear in the book, resonates with the novel’s center, a story of what waits for us on the other side of this life and the mistakes we make in it. River of Heaven is about the cost of living a lie, the chains that bind us to our past, and the obligations we have to those we love. At the end of the book, after he’s told Duncan the real story about Dewey, Sam says, “Times like these I try harder than ever to believe there’s a kinder world going on somewhere else beyond this one, and, if there really is, we’ll all find it one day.” Earlier, he thinks about the ones who go before us: “I like to think the spirits of the dead keep watch for us, and when the time comes to join them, they shine a light to carry us across the river of heaven.” Dewey Finn waits for Sam in that other world, a place Sam prefers to imagine as one “where no one betrays friends or brothers, and there’s no one to hate, not even yourself, and nothing to regret, and no reason to live in shame.” For fifty years, he’s wanted to live fully in the world. River of Heaven is the story of his journey toward that end as he learns to believe himself worthy of giving and receiving love. A story of one man’s life in a small town and how an act from the past can determine the future. I believe that writing fiction is ultimately an act of empathy, and I like to create characters who are very different from me and then challenge myself to imagine what it’s like to move through the world inside their skin. That’s what I’ve done with Sam. I started by asking myself what a man might be carrying with him that would make building that elaborate doghouse something he’d want to do. Sam started talking to me, and I listened, eager to see what I could learn. Now, he’s waiting to talk to you.